Temporomandibular joint. That’s your jaw joint, but its acronym, TMJ, has become the short-hand term for problems associated with it. Clinically, it’s called TMJ Syndrome or Disorder, and often presents itself as a popping sound and sensation near the jaw joint. TMJ Disorder symptoms take many forms, such as headaches, earaches, stuffiness, ringing in the ears, dizziness, numbness in fingers and arms, limited movement or locking of the jaw, and pain of many types (behind the eyes, in the face, back, neck or shoulders). In many cases, worn or cracked teeth are the only symptoms and pain does not occur until the disorder has advanced. In order to determine the best course of TMD treatment, an accurate diagnosis is imperative. Consult with Dr. Toomey to determine if you are suffering from TMJ Syndrome. Many times, all that’s needed is a simple adjustment to your bite (the way your teeth come together), or a small, specialized mouthpiece that corrects the way your jaw joint closes and allows it to rest while you sleep. TMJ Syndrome treatment in Baltimore doesn’t have to be overwhelming, and we can help you get back to a life without pain. 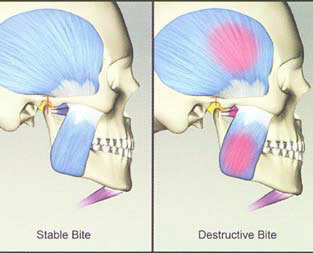 At Toomey Dentistry, we have advanced training in TMJ Disorders. We use a unique and specialized presentation program called BiteFX™, that uses friendly animations to explain problems in a way that makes sense. With BiteFX, our patients quickly understand complicated concepts that were previously difficult to explain. Dr. Toomey will use your own photos and x-rays, along with BiteFX, to help you to understand the best treatment options for you. Jaw soreness, headaches, waking up tired, grinding, even hearing problems… these are just a few of the basic symptoms of bite problems. Often, these patients also have receding gums, wear marks on chewing surfaces and cracked teeth. Many patients are unaware that there is any problem at all. Fortunately, a great number of those who suffer from these common symptoms can be easily diagnosed and helped. In many dental practices, the patient would be told that they simply grind their teeth and would be prescribed a night guard. Some would get better, but most became frustrated at their problem not truly getting fixed. Night guards are like aspirin for a headache. Unless the root of the problem is revealed, the symptoms will go on and on. Dr. Toomey will evaluate your bite to determine if your symptoms are dental-related or not. In fact, a bite evaluation is simple, painless and part of our regular dental exam. After this bite evaluation, Dr. Toomey might recommend that you be measured and evaluated in greater detail to correct the problem permanently. After all, we’re dedicated to improving our patients’ lives by improving their comfort, sleep and longevity of their natural teeth.